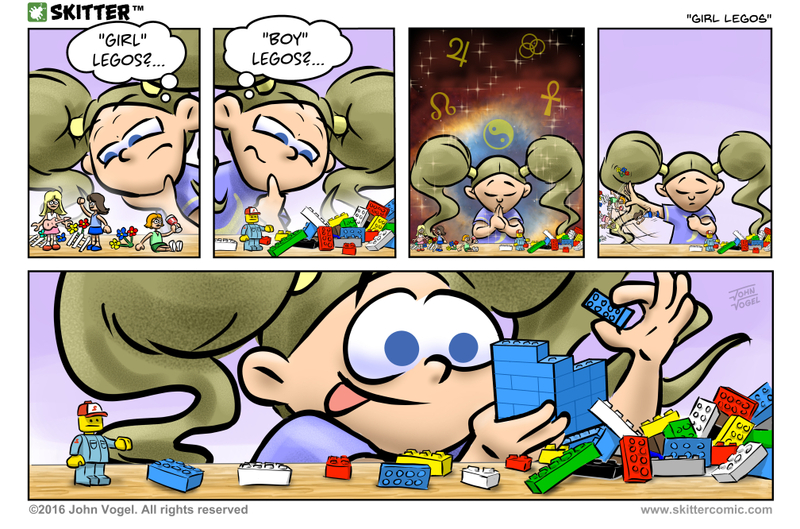 When I was a kid, there were no “girl legos”, there were just “Legos“. I didn’t know any girls who played with them. Now there are these… dollies… that are somehow associated with the Lego brand. They present it as a toy you can build things with, but the emphasis seems to be on ‘playing house’, not ‘building houses’. It’s kinda sad. I submitted my Patreon page to be critiqued by Brad Guigar on Webcomics.com. I knew it needed an overhaul and, since he was offering, it seemed a great opportunity to get his thoughts before I made the changes. WOW did he hate my Patreon. He smote its ruin on the mountainside like a wizard smites a balrog. No punches were pulled; or if they were those punches must have been massive. But all his points were completely valid. My Patreon page stunk. So I overhauled it based on the critique. I think it’s much better as a result. Thank you, Brad! You can all see it by clicking here. That is pretty awful that options exist that you personally don’t care for. But…..the flowers. Does nature mean nothing to you Lego-over everything industrialists!?! ?